We disagree with the current Article 17 assessment for the River lamprey Lampetra fluviatilis for Ireland. This concludes that river lamprey is at ‘Favourable’ Conservation Status in Ireland. River lampreys are poor swimmers and are less able to pass barriers than sea lampreys. River lampreys are therefore confined to below structures such as weirs in the lower reaches of many of our Natura 2000 rivers. These areas are also generally under significant pressure as a result of flood schemes and other river engineering schemes. As they are normally present in the lower reaches of rivers, their distribution also coincides with areas most at risk from water quality pressures. Likewise, these areas are often urban and at risk of flooding due to upstream land management practices; so the areas where river lampreys occur are also disproportionately affected by pressures and threats identified for lampreys species. That’s all fine, but would we miss the sea trout for example? Should management focus on Salmo trutta as a single species and forget about the sea trout? The conservation status of river lampreys was rated as ‘Favourable’ in Ireland because of the inability to tell juvenile Brook lamprey Lampetra planeri and Lampetra fluvialitis ammocoetes apart – so they were just grouped together. 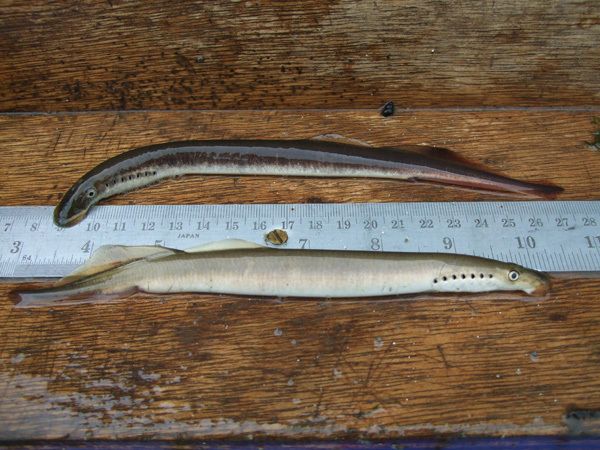 It is clear that Brook lampreys are at ‘Favourable’ status in Ireland, but it is likely that River lampreys are not; indeed we think that River lampreys are the most vulnerable of the three lamprey species in Ireland and they should not have been assessed as having a ‘Favourable’ status. Applying the precautionary principle they should be given a lower conservation status rating in our opinion. We know that most authors in the past have regarded the river and brook lamprey as being very closely related, and that some have considered them effectively the same species (Maitland, 2003). It has been suggested that they are ‘paired species’ – the term used for pairs of morphologically similar lampreys, one a non-parasitic species probably derived from the other, a parasitic species. Indeed, most lamprey genera occur in two forms with divergent life histories: a parasitic anadromous form and a non-parasitic freshwater non-migratory form. The ammocoete phases of river lampreys and brook lampreys are indistinguishable, and most of the survey data in Ireland is based on ammococoete surveys which cannot determine which species of Lampetra sp. is present. There has also been an underlying consideration that they were actually just two variations of the same species. Indeed, Hume (2013) notes that L. planeri should not be considered as a distinct species, either morphologically or genetically. Instead, Hume (2003) contends that L. fluviatilis appears capable of expressing a range of life history strategies; from parasitic anadromous populations through to non-parasitic stream-resident populations. Hume (2003) says that as “L. fluviatilis (L. 1758) was used prior to L. planeri (Bloch 1784), the species name for both should be Lampetra fluviatilis”. That’s all fine, and may be so, but would we miss the sea trout for example? Should management focus on Salmo trutta as a single species and forget about the sea trout? At the moment L. planeri and L. fluviatilis are formally different species, and must be treated as such under the EU Habitats Directive. Regardless of their taxonomy, they have quite different habitat and management requirements. Rating them at ‘Favourable’ status has, in out opinion, put them at further risk in Ireland. It is noted that in Ireland, Inland Fisheries Ireland recognise numerous different varieties of brown trout (i.e. sea trout, brown trout, croneen, ferox, gillaroo, sonaghen, dollaghan etc,) and are setting out to manage them separately. There is also increasing evidence which may be reinforcing their current classification as separate species. Mateus et al (2013) in their recent paper ‘Strong genome-wide divergence between sympatric European river and brook lampreys‘ show that there are significant genetic differences between these two species. In this paper the authors state that “we show that the sympatric lampreys L. fluviatilis and L. planeri are genetically highly distinct, and that the regions of strongest divergence contain several candidate genes for adaptation to a migratory versus resident life-style“. Their genetic analyses showed that the “the specimens are grouped into two clades, which exactly match the two species L. fluviatilis and L. planeri“. They also noted that “interestingly, most of the genes showing fixed allelic differences between the two lampreys are related to functions that have previously been implicated in the adaptation to a migratory versus resident lifestyle in lampreys and bony fishes“. River (and brook) lampreys have a poor ability to pass hydrometric weirs like this one in the River Suir SAC. Salmon counters also block the migration of river lampreys, and are being increasingly installed in the lower reaches of Irish rivers. They are currently separate species, and formally recognised as such, with one being called Lampetra fluvialitis and one being called Lampetra planeri. There is recent genetic evidence to reaffirm this current situation. We believe they need to be managed as separate species in Ireland (and other European countries). Common sense and knowledge of their swimming abilities would result in the realisation that river lampreys would not be as widespread in most catchments in Ireland as brook lampreys. During surveys IFI staff should have realised that if you are surveying in rivers above barriers (i.e. hydroelectric dams or their own crump weir salmon counters) that the Lampetra sp. ammocoetes you will be encountering will almost certainly be L. planeri. River lampreys are currently listed as a separate species from brook lampreys, with different habitat and management requirements, and subject to quite different pressures and threats. They cannot be managed effectively if they are grouped together with brook lampreys, as has happened in Ireland. You can’t manage sea trout Salmo trutta and brown trout, also Salmo trutta, in the same manner, for example. It is appreciated that more research is required here, but the precautionary principle has to apply. The results from the Mateus et al (2013) study support the approach of managing them as separate species. It is noted that in Ireland, Inland Fisheries Ireland recognise numerous different varieties of brown trout (i.e. sea trout, brown trout, croneen, ferox, gillaroo, sonaghen, dollaghen etc.) and are setting out to manage them separately. Indeed we have tens of different trout “species” according to most IFI staff on the ground, all requiring protection. Just because there are no fisheries for lampreys in Ireland, does not mean that they should not get the same attention to detail. River lampreys are currently a separate species from brook lampreys, with different habitat and management requirements, and subject to quite different pressures and threats. They cannot be managed effectively if they are grouped together with brook lampreys, as has happened in Ireland. It is appreciated that more research is required here, but the precautionary principle should apply. Brook lampreys are, despite everything, doing well in Ireland because we have a wet climate and they occur in all sizes of river throughout the country. Both species of anadromous lampreys are at risk in Ireland however, and we believe that river lampreys are in more danger than sea lampreys. River lampreys have disappeared from many rivers across Europe due to pollution, river engineering and various impassable barriers (Maitland, 2003) and these pressures are significant in the lower reaches of almost all rivers in Ireland where they occur. Pereira & Almada (2013) have suggested that river lampreys may be accidentally philopatric due to their small size keeping them in estuaries resulting in them to be more likely to return to their natal streams. This has significant consequences for management. River lampreys often occur in association with the other two other lamprey species, but only Lampetra sp. lampreys have been recorded on the River Bandon, Co Cork. This river is in our opinion one of the best rivers in Ireland for this species. However this population is under significant threat from dredging and a major proposed flood scheme; the photos here show some of the impacts we observed recently. 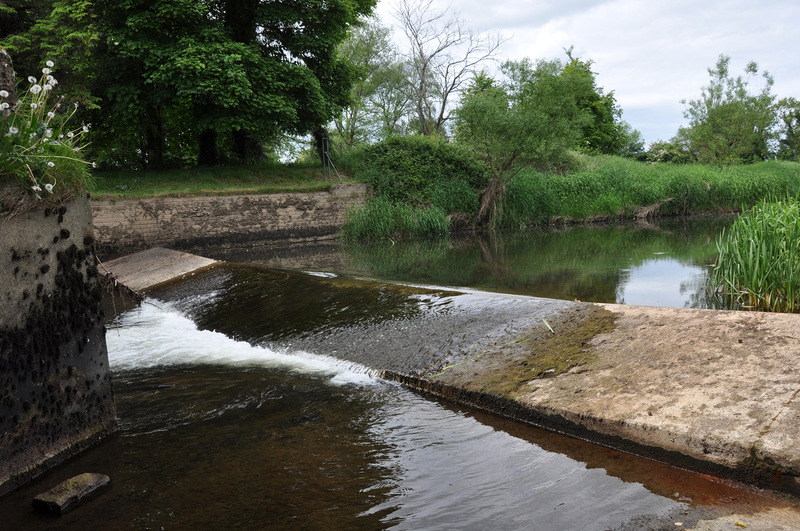 The River Bandon is good for this species as they have access to over 5km of ideal spawning and nursery habitat on the lower reaches of this river, extending from the tidal reaches at Inishannon to Bandon weir (which is impassable for lampreys). There is also a long estuary, ideal for adult foraging. On the Rivers Fergus, for example, this species only has access to about 1km of suitable spawning and nursery habitat (now damaged to an integrity level by an OPW Flood Scheme). River lampreys are currently a separate species from brook lampreys, with different habitat and management requirements, and subject to quite different pressures and threats. A major flood scheme is also planned for the Lower River Bandon; following on from the political ‘let’s be seen to be doing something‘ dredging shown in the photographs shown here. Although we undertook the fish stock survey which informed the the Environmental Impact Statement (EIS) for this proposed scheme, in which we identified the presence of significant lamprey (and salmonid) populations. We were not involved in the impact assessment or preparation of mitigation measures, which at present we consider to be insufficient to protect river lampreys. Water quality mitigation – Irish style! River Bandon, Co Cork. These are straw bales topped with sediment dredged from the river. We found straw bales a few kilometers downstream from here. All these bales, and any silt they temporarily trapped, got washed downstream in the end. How anyone ever thought that this would work or was suitable is beyond us. Some readers may think that we are just writing negative articles, and have a grudge against the authorities in Ireland or something like that. However this is simply not true – we just care passionately about lampreys and their protection in this country. 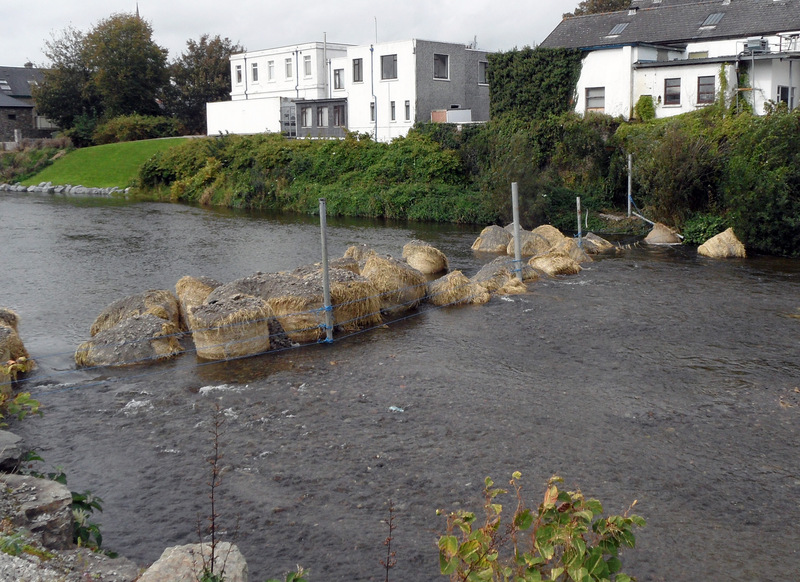 Just have a look at the silt fence in the photo above that was provided to protect water quality during politically motivated dredging works on the River Bandon. If you care about lampreys and the protection of rivers, you should be as upset by this, as we are. 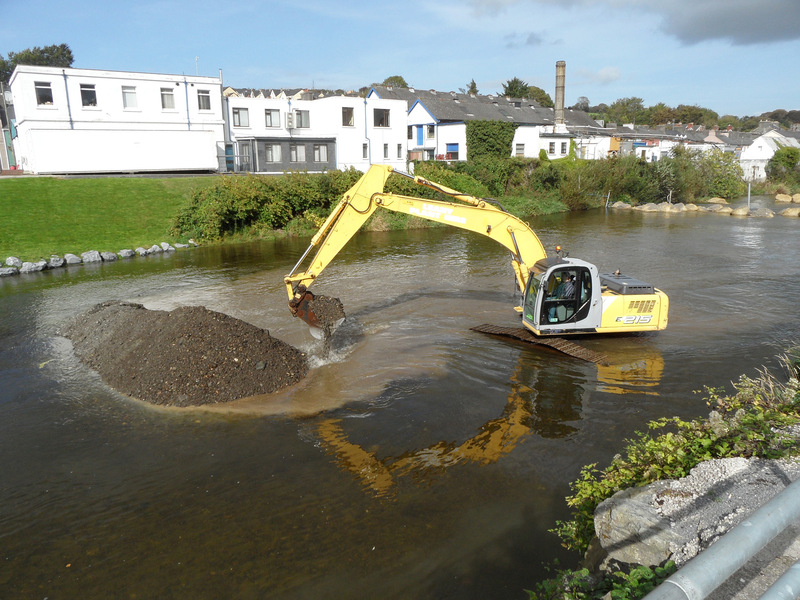 The dredging works in the photos above of the River Bandon will also not help alleviate any flooding in Bandon town. Indeed, the flooding in Bandon is down to previous drainage works upstream from here that aimed to get water off agricultural land and down the river as fast as possible; until it floods out at Bandon town. We need to look at flood risk management more holistically, and there is growing awareness of the need for more imaginative flood schemes. The river lamprey is in urgent need of protection in Ireland, and grouping it with the much more common and widespread non-migratory brook lamprey in the current Article 17 assessment is not helpful for its conservation, management and protection in Ireland. ECOFACT (2011) Bandon Flood Relief Scheme. Fish Stock Assessment Report. November 2011. John B. (2013) The evolutionary ecology of lampreys (Petromyzontiformes). PhD thesis, University of Glasgow. Mateus CS, Stange M, Berner D, Roesti M, Quintella BR, Alves MJ, Almeida PR, Salzburger W. (2013) Strong genome-wide divergence between sympatric European river and brook lampreys. Curr Biol. 2013 Aug 5;23(15):R649-50. doi: 10.1016/j.cub.2013.06.026. Maitland PS (2003). Ecology of the River, Brook and Sea Lamprey.Conserving Natura 2000 Rivers Ecology Series No. 5. English Nature, Peterborough.